This year for nonfiction 10 for 10, I invite you to dive into the ocean and explore the wonders of ocean life and ocean exploration. This is my fifth year participating in this meme. Last year I featured titles that allowed readers to travel the world. Dive Down Deep! Head into the water! How can we not be intrigued at the idea that we may only have encountered half of the large animals living in the sea? In this title, being lost in a book means getting lost in a completely different world – in this case the magical world of coral reefs. A mixture of gorgeously painted illustrations, detailed relevant diagrams and the story of how the great whites hunt in the Farallon Islands so successfully. This book illustrates how sharks are perfectly adept hunters, at the top of the food chain. Such a book. I love the images, the rhythm of the text and the mystery of the still not known that is conveyed. An incredible read aloud for children who love to be amazed by nature. I loved the illustration of the blue whale’s mouth with 50 people standing in its lower jaw! A beautiful, lyrical story with stunning paintings by Wendell Minor. Follow this real life rescue of a humpback whale. The reader is invited into the world of seals. Learn all about gray seals – how they move, how they hunt and how their body is perfectly suited to their ocean home. I love when nonfiction is the perfect blend of incredible story and breathtaking pictures – increases the wonder factor exponentially! What are your favourite books about the ocean? 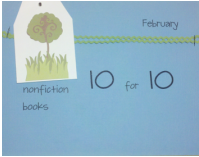 This entry was posted in Non-fiction and tagged #nf10for10, Candace Fleming, Chris Butterworth, Claire A. Nivola, eric rohmann, Heather Lang, Jason Chin, Jenni Desmond, Jordi Solano, Kate Nelms, Katherine Roy, nonfiction, Raúl Colón, Robert Burleigh, Steve Jenkins, Wendell Minor by carriegelson. Bookmark the permalink. I love your collection especially on a bitter cold morning. There are ocean days ahead! I like how you didn’t just focus on sharks or one specific kind of animal. Thank you for your support and joining us once again. I love the pb 10 for 10 community and always look forward to the days we all share the books we love! Love this theme! I love coming to your site to see how you put books together. Another great list! Wonderful to see all these together, Carrie. I just got Swimming With Sharks from the library! There is much to love, and care for, in the ocean. Will look for that seal book! Thanks! You have so many beautiful titles here, Carrie. They are wonderful, I agree! Awesome list! Solving the Puzzle is really one I need to get – and I could look at those Neighborhood Shark illustrations for hours! The color of this book collection makes me feel like I’m diving down deep in the ocean. This is a great theme with beautiful books. I love Trapped, Swimming with Sharks, and Giant Squid. I particularly love ocean books! So many people have mentioned Solving the Puzzle Under the Sea. I can’t wait to get that one now. What a wonderful list. My older daughter was obsessed with marine biology for a while so it is always great to tuck away book titles like these. It’s a wonderful one. I just ordered it so I have a classroom copy. Many familiar titles on this list, Carrie and a few I will now be reading. The Sylvia Earle book is such a favorite of mine. I admire her so. This is a wonderful collection of books. My granddaughter and I do a lot of reading and activities for Shark Week, and we expand to other sea related books during that time in the summer too. I will add many of these to our TBR. So pleased this is helpful! Love this collection and the way you balanced books about sea life and books about people who study the sea. So important for kids to understand how we learned about life in the sea. I agree and hopefully some of them will grow up to study the ocean.